Extreme makeover: are humans reshaping Earth? 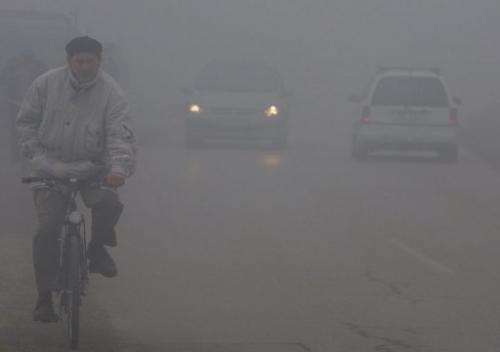 A Bosnian man rides his bicycle in a foggy street in Sarajevo. Evidence of abrupt change -- on a geological time scale -- wrought by human hands would seem to be overwhelming. If alien geologists were to visit our planet 10 million years from now, would they discern a distinct human fingerprint in Earth's accumulating layers of rock and sediment? Will homo sapiens, in other words, define a geological period in the way dinosaurs -- and their vanishing act -- helped mark the Jurassic and the Cretaceous? A growing number of scientists, some gathered at a one-day symposium this week at the British Geological Society in London, say "yes". One among them, chemistry Nobel laureate Paul Crutzen, has even suggested a new name: the Anthropocene. Whether this "age of man" will be short or long is unknown, says Crutzen, who shared his Nobel for unmasking the man-made chemicals eating away at the atmosphere's protective ozone layer. For the first time in Earth's 4.7 billion year history, a single species has not only radically changed Earth's morphology, chemistry and biology, it is now aware of having done so. "We broke it, we bought it, we own it," is how Erle Ellis, a professor of geography and ecology at the University of Maryland at Baltimore, put it. "We don't know what is going to happen in the Anthropocene -- it could be good, even better," he said. "But we need to think differently and globally, to take ownership of the planet." Dinosaurs were most likely wiped out by a giant meteor that cooled Earth's temperatures below their threshold for survival. An analogous fate could await humans if temperatures climb by five or six degrees Celsius, which climate scientists say could happen within a century. But dinosaurs thrived for more than 150 million years before a cosmic pebble ended their extraordinary run, while modern humans have only been around for about 200,000 years, a snap of the fingers by comparison. Another key difference: dinosaurs didn't know what hit them, and played no role in their own demise. Humans, by contrast, have been the main architects of the enormous changes that are threatening to throw what scientists now call the Earth System out of whack. Since Crutzen coined the term a decade ago, the Anthropocene has been eagerly adopted by scientists across a broad spectrum of disciplines. "It triggered the realisation that we were in an entirely new era of planet Earth," said Will Steffen, head of Australian National University's Climate Change Institute. It also triggered fierce debate. 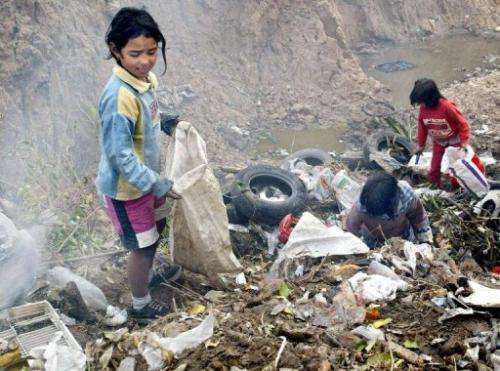 Children scour a landfill. Humans, by contrast, have been the main architects of the enormous changes that are threatening to throw what scientists now call the Earth System out of whack. At one level, the issues are narrow to the point of pedantry -- rock experts quibbling over whether mankind's present and future geological imprint merits recognition by the International Commission on Stratigraphy. At the same time, however, the concept forces us to ponder whether humanity's outsized impact on the planet could lead to undesired, possibly uncontrollable, outcomes, and what, if anything, humanity should do about it. That leaves scientists who may be more comfortable classifying rocks than rocking the boat in a tricky position. For now, the man in the hot seat is University of Leicester professor Jan Zalasiewicz, who heads the group of geologists tasked with recommending whether the Anthropocene should be added to the 150-odd eons, eras, periods, epochs and ages into which the last 3.6 billion years of Earth's history has been officially divided. "Jan must recognise the implications for society if his own tribe decides, using classical criteria, that there is not yet enough evidence to formally recognise a new boundary in the geological record," said Bryan Lovell, president of the British Geological Society and a professor at Cambridge. Evidence of abrupt change -- on a geological time scale -- wrought by human hands would seem to be overwhelming. The burning of fossil fuels has altered the composition of the atmosphere, pushing the concentration of carbon dioxide to levels unseen at least for 800,000 years, perhaps for three million. The resulting global warming has itself set in motion other planetary-scale changes: massive melting of the parts of Earth normally covered by ice and snow (aka the cryosphere), and the acidification of the oceans. Past shifts in the biosphere -- the realm of the living -- show up in sediment and rock, especially mass extinctions that have seen up to 90 percent of all lifeforms disappear within the geological blink of an eye. There have been five such wipeouts over the last half billion years, and most scientists agree that we have now entered the sixth, with species disappearing at 100 to 1,000 times the so-called "background" rate. Another key index is the rise of invasive species travelling in a globalised world via ship ballasts, air travel and old-fashioned smuggling. "The mass homogenisation event" -- finding the same species everywhere -- "will be quite a clear signal in the archaeological record a million years from now," said Zalasiewicz. Even the planet's outer skin, or lithosphere, has been transformed. "We are sculpting the surface of the Earth," said James Syvitski, a professor at the University of Colorado, pointing to two centuries of industrial-scale mining, damming, deforestation and agriculture. 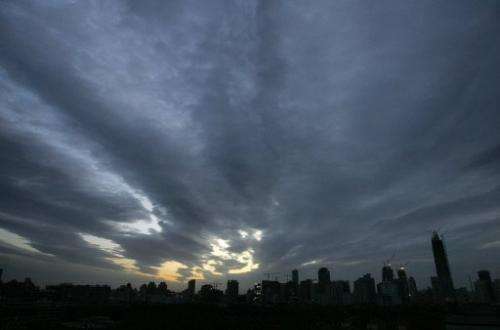 Clouds hover above Beijing. If the hugely complex web of chemical and biological interactions that sustains most life does tip seriously out of kilter, the planet will find a new equilibrium, as it has in the past. Thousands of dams built since the mid-19th century have "completely altered the planet's terrestrial plumbing," he said. To validate the Anthropocene, all these changes will be measured against the range of variation in our current geological period -- the Holocene epoch -- which began some 12,000 years ago as Earth emerged from the last ice age. "Human influence on the global environment must push the Earth system well beyond the Holocene envelope of variability," said Steffen. By one key measure, at least, we already have: the concentration of CO2 in the atmosphere -- measured in parts per million -- remained in a narrow range of 260 to 285 for nearly 12,000 years. Today is stands at 390 ppm, and is sure to rise considerably higher in coming decades. If the hugely complex web of chemical and biological interactions that sustains most life does tip seriously out of kilter, the planet will find a new equilibrium, as it has in the past. Earth, in other words, will do fine. Humans, on the other hand, may find the transition more than difficult. "It is a planet that will be much warmer, much stormier, much less biodiverse," said Steffen. "We will need to be very resilient as a species." In nailing down the Anthropocene, there is also a question of timing. Some scholars favour dating it to the start of agriculture, some 8,000 years ago. Most, however, favour hammering the "golden spike" in the middle of the 19th century when the steam engine and then fossil fuels kicked off an exponential explosion in population and consumption that is still gathering pace. Starting around 1950, the "Great Acceleration" has seen dozens of key indicators, plotted on a graph, take off like a rocket: population, damming of rivers, water and fertiliser use, paper consumption, tourism, and vehicles, to name a few. These, in turn, have sparked correspondingly sharp rises in greenhouse gas concentrations, ozone depletion, great floods, depletion of fisheries, loss of forests, species loss. The dramatic transformation we have seen so far has been driven mainly by the 20 percent of the world's population living in rich nations. Crutzen said he hopes that putting a name -- the Anthropocene -- to these changes may help focus humanity's mind on the challenges ahead. "It could well be a paradigm shift in scientific thinking," he said at the London meeting. "But it will probably take another 20 years before it is formally accepted." This interglacial (like all the interglacials before) will end. Glaciers will scour clean the northern hemisphere. "10 million square miles of the earth was covered by ice. During this time, Iceland was completely covered as was much of the area south of it as far as the British Isles. In addition, northern Europe was covered as far south as Germany and Poland. In North America, all of Canada and portions of the United States were covered by ice sheets as far south as the Missouri and Ohio Rivers. The Southern Hemisphere experienced the glaciation with the Patagonian Ice Sheet that covered Chile and much of Argentina and Africa and portions of the Middle East and Southeast"
Deserts expanded. Sea levels went down about 164 feet (50 meters) in 1,000 years. These levels then stayed relatively constant until the ice sheets began to melt toward the end of the glacial period." I kinda of doubt it. 10 million years is a long time. The things that might be odd to an external observer would probably be in discovering what sorts of processes moved all the 'junk' we've created from the mantle to the surface or just below the surface. Concentrations of metals and so forth. "Dinosaurs were most likely wiped out by a giant meteor that cooled Earth's temperatures below their threshold for survival." No news here. Everybody knows dinosaurs were wiped out when dinosaur scientists horribly botched a revolutionary new asteroid mining mission. Look at those lovely little girls scouring the trash heap. Capitalism at it's best. Teach the little ones that working and subservience to the corporate elite is the only way they can survive. Praise be to communism that obliterates capitalism, tramples freedom, hampers progress, prevents competition that induces better products at lower costs, and destroys people's desire for excellence, hampers advanced technologies that make web sites like this one and it's content possible. Yes, let's ditch capitalism. Capitalism's not perfect, but show me a better system and I'll not only jump on the bandwagon, I'll drive it. I think this article makes a valid point. The rate of change in the environment over the last few hundred years is unsustainable over geologic scale of time. I think we are in the middle of a change from one stable system to another. If so, then the change from one stable system to another that we are experiencing will give few and often misleading conclusions as the end stable state that is reached. CSharpner. "Capitalism's not perfect, but show me a better system and I'll not only jump on the bandwagon, I'll drive it." I am a fan of Distributism, where the only permitted owners of an organisation are the workers. Back to the topic. One factory pumping out methane is enough to keep the Ice away. I am very fond of Ice. I am an I2a (P37.2) Ice has made me who I am. We spent the last Ice age holed up in the Balkans. All 10 thousand years of it. The Gaia Hypothesis by Lovelock is a good read. Imagine future archeologists identifying sites frequented by the Budweiser, Coca Cola, Coors, Pepsi, etal. tribes. We have eliminated the cycle of ice ages due to human co2 emissions? We have the ability to control weather patterns with taxation and laws? Human life is the dominant shaping force on the earth, outstripping tectonics, solar radiation, and all other physical processes? Cmon guys, not even the insane believe this kind of delusion. Which of those is presently causing the greater rate of change? How will we address the horrors of cyanobacteria destroying our beautiful carbon dioxide world? They are running rampant in the seas, gobbling up our precious CO2 and belching filthy oxygen into the environment. At this rate of change, our ecosystem will forever be altered and only oxygen-breathers will survive. We can't stress the dangers of oxygenating our world enough - action is required immediately to stave off the worst environmental crisis our planet has ever seen! Down with oxygen emissions! Down with free reproduction and unrestricted respiration! Any change is bad change, shouldn't the world remain the same forever? What is normal weather on earth, anyway?